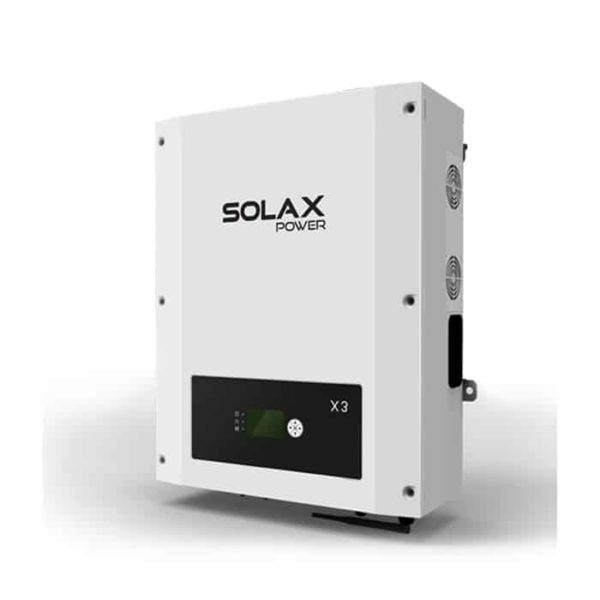 The Solax ZDNY-TL15000 X3 Three Phase 15kW Solar Inverter from SolaX offers installers a flexible number of options for specifying commercial scale systems combined with industry established quality, reliability and efficiency. The SolaX vision is to be a world leader in the development, production and distribution of solar inverters. With wide ranging MPPT to allow for maximum energy harvesting, OptiCool temperature controlled fan for cooling and optional WiFi monitoring via SolaX’s X-Cloud platform, the X3 range provide the ideal inverter solution at the heart of your three-phase solar PV system. SolaX products are designed, tested and manufactured to the highest global standards. Proudly supported by 16 international offices with 24-hour, 7 days per week on-line service, our products are exported to 47 countries via 200 distribution channels. SolaX employ more than 80 senior engineers at a state of the art 240,000 m2 production facility that has benefited from more than USD$20,000,000 of investment in advanced manufacturing and testing facilities. Our R&D team is 200 strong and we employ more than 700 people worldwide. The company is driven by its commitment to R&D, and SolaX Power is proud to be affiliated with the Zhejiang University, one of the leading research universities in China and home to the only national silicon material laboratories in China’s ‘Silicon Valley’. Join our ZERO Home Bills Community. The best Solar Inverters at best retail prices for ZERO Home Bills on ZEROhomebills.com by Solaranna. SolaX products are designed, tested and manufactured to the highest global standards. Proudly supported by 16 international offices with 24-hour, 7 days per week on-line service, our products are exported to 47 countries via 200 distribution channels. SolaX employ more than 80 senior engineers at a state of the art 240,000 m2 production facility that has benefited from more than USD$20,000,000 of investment in advanced manufacturing and testing facilities. Our R&D team is 200 strong and we employ more than 700 people worldwide. The company is driven by its commitment to R&D, and SolaX Power is proud to be affiliated with the Zhejiang University, one of the leading research universities in China and home to the only national silicon material laboratories in China’s ‘Silicon Valley’. Join our ZEROhomebills Community. BEST Products from the BEST Brands at BEST Prices for ZERO Home Bills on ZEROhomebills.com by Solaranna.